TaKe Us, ce sont 50 oeuvres originales qui seront offertes dans la rue aux gens curieux. 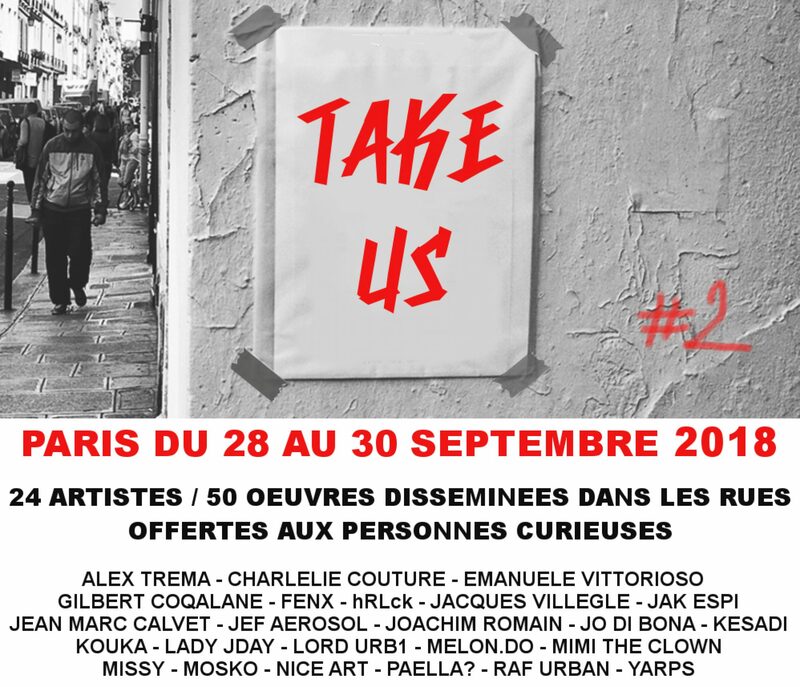 Insérées dans des pochettes calques sur lesquelles est inscrit en rouge TAKE US, ces créations seront disséminées dans les rues de Paris les 28, 29 et 30 Septembre prochain. 750 pièces ont déjà été offertes dans la rues pour environ 150 retours de »TaKers ». Alors, si vous êtes à Paris les 28, 29 ou 30 Septembre 2018, ouvrez grands les yeux et soyez curieux ! Urban artistic project shared by around twenty artists. TaKe Us, are 50 original artworks which will be offered in the streets to curious people. Inserted in translucent paper outer with a red inscription ‘’TAKE US’’, theses creations will be disseminated in the streets of Paris from the 28th to the 30th of next September. Taped on walls, doors or in buses, they will be found or lost for ever ! People who find an artwork are then invited to be an active part of this project. They have to take a picture of their discover with their own creativity and to send it through email or Facebook to the artist. TaKe Us is infist a project based on sharing, it is a free act, some pure generosity between n artist and an unknow people. Then, if you will be in Paris from the 28th to the 30th of September 2018, open your eyes and be curious !